Scientists use restriction enzymes to cut DNA into smaller pieces so they can analyze and manipulate DNA more easily. Each restriction enzyme recognizes and can attach to a certain sequence on DNA called a restriction site. You can think of restriction enzymes as little molecular scissors that slide along the DNA and cut the sugar-phosphate backbone wherever they find their restriction site. The figure shows how a restriction enzyme can make a cut in a circular piece of DNA and turn it into a linear piece. Some restriction enzymes make a straight cut through the DNA backbone, while others, like the one shown in the preceding figure, make staggered cuts. The enzymes that make staggered cuts leave small pieces of single-stranded DNA at the ends of the fragments they cut. Scientists call these single-stranded pieces sticky ends because they have complementary sequences to each other and tend to stick together by hydrogen bonds. You can get two different pieces of DNA to stick together if you cut them both with a restriction enzyme that makes sticky ends. The two pieces tend to attach to each other, making it possible to combine them into a recombinant DNA molecule that has DNA from two sources. A small, linear piece of viral DNA is shown in the next figure. The viral DNA contains restriction sites for two different restriction enzymes, called EcoR1 and HindIII. If you used just EcoR1 to cut a sample that contained many copies of this piece of DNA, how many differently sized pieces of DNA would result? What size would they be? If you cut the DNA with just HindIII, what would result? And what would happen if you cut the DNA with both enzymes? Example of cutting DNA with restriction enzymes. For questions 2–4, test your understanding of restriction enzymes by using the information in the following figure to answer the questions. Practicing with restriction enzymes. A circular piece of DNA, called a plasmid, is 80 kb long. 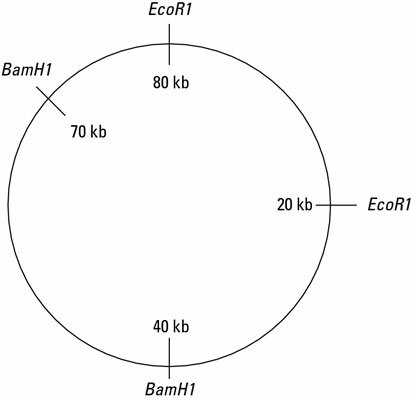 The marks on the plasmid indicate restriction sites for the enzymes EcoR1 and BamH1. What types of DNA fragments would result if you were to cut a DNA sample containing many copies of the plasmid shown in the figure with the restriction enzyme EcoR1? What types of DNA fragments would result if you were to cut the plasmid shown with both restriction enzymes, EcoR1 and BamH1? What types of DNA fragments would result if you were to cut the plasmid shown with the restriction enzyme HindIII? The following are the answers for the practice questions. If you cut the DNA with just EcoR1, the DNA would be cut right in the middle. All the pieces would be the same size, which would be 15 kb long. If you cut the DNA with just HindIII, the DNA would be cut at the 22.5 kb mark. Half of the DNA pieces would be 22.5 kb long, and the other half would be 7.5 kb long (30 kb – 22.5 kb = 7.5 kb). The answer is b. 1/2 20 kb, 1/2 60 kb. EcoR1 would make two cuts in each plasmid. One fragment would be the length from 0kb to 20kb, which is 20kb; the other fragment would be the length from 20kb back to 80kb, which is 60kb. The answer is a. 1/2 20 kb, 1/4 30 kb, 1/4 10 kb. If you cut the plasmids with both restriction enzymes, you’d end up with four fragments per plasmid — two 20kb in length, one 30kb, and one 10kb. The answer is d. All 80 kb. If you cut the plasmid with the restriction enzyme HindIII, you wouldn’t get any cuts because there aren’t any restriction sites for this enzyme (restriction enzymes are specific to the sites they recognize).